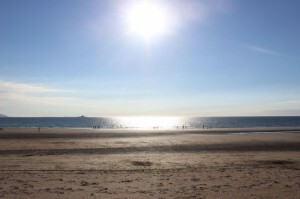 HERE’S some great news if you want to head to the beach over the coming weeks…once we get the weather! 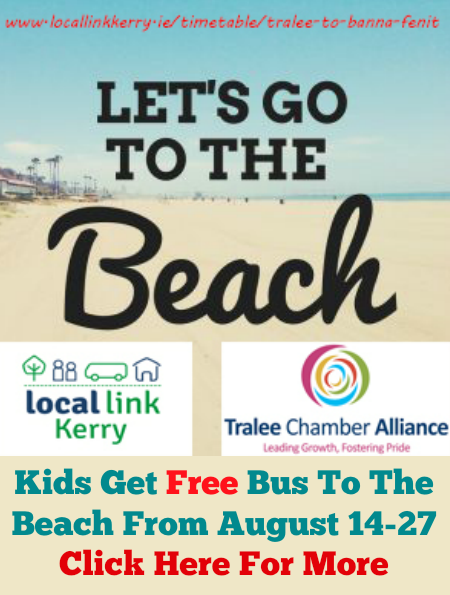 Local Link Kerry, in Partnership with Tralee Chamber Alliance, is running a Pilot Bus service, two days a week from Tralee to Fenit and two days a week from Tralee to Banna Beach, for the month of August. Even better, they are running ‘Kids For Free’ for two weeks on all regular services, including the Banna and Fenit routes, as part of a National Campaign taking place from the 14th to the 27th August. The service to Banna will operate on Wednesday and Fridays and Fenit Service will operate Thursday and Saturday with five pick up points in Tralee town with the last pick up point at 10.55am and will depart the Beach at 14.25. The usual cost of service is Adult €5, 13yrs to 19 yrs – €3, 4 to 12yrs – €2 under 3 Free and Free Travel Pass accepted. However, on August 16, 17, 18, 19, 23, 24, 25 and 26, people under the age of 19 can head to the beach for free. Adults are €5 return. This initiative is to promote access to the Beaches and Recreational activities for all ages. Click on www.locallink.ie to find out more about routes and click here for the Banna and Fenit route timetable. Currently there are in excess of 140 regular bus routes operating all over Kerry under the management of Local Link Kerry. Local Link Kerry (LLK) manage and co-ordinate the delivery of a combination of scheduled Public and Community Transport Services in Co. Kerry. LLK also coordinate a range of services for Agencies and Organisations around the County. Local Link Kerry is the Trading Name of Kerry Community Transport CLG and is an agent of the National Transport Authority. Kerry Community Transport CLG is an Independent Company with Charitable Status and is a non- profit organisation. There are 17 Local Link offices nationally. Please ring Local Link Kerry on 1890 528 528 for queries on existing bus services or if you can identify the need for a transport service in your area. fantastic,can we get brochures, perhaps I will check those links to see if they are there. is that round trip price?